Not to be confused with Canadian Transportation Agency. Transport Canada (French: Transports Canada) is the department within the Government of Canada responsible for developing regulations, policies and services of transportation in Canada. It is part of the Transportation, Infrastructure and Communities (TIC) portfolio. The current Minister of Transport is Marc Garneau. 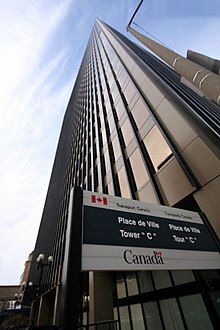 Transport Canada is headquartered in Ottawa, Ontario. The Department of Transport was created in 1935 by the government of William Lyon Mackenzie King in recognition of the changing transportation environment in Canada at the time. It merged three departments: the former Department of Railways and Canals, the Department of Marine and Fisheries, and the Civil Aviation Branch of the Department of National Defence (c. 1927 when it replaced the Air Board) under C. D. Howe, who would use the portfolio to rationalize the governance and provision of all forms of transportation (air, water and land). He created a National Harbours Board and Trans-Canada Air Lines. The Department of Transport Act came into force November 2, 1936. Prior to a 1994 federal government reorganization, Transport Canada had a wide range of operational responsibilities including the Canadian Coast Guard, the Saint Lawrence Seaway, airports and seaports, as well as Via Rail and CN Rail. Significant cuts to Transport Canada at that time resulted in CN Rail being privatized, the coast guard being transferred to Fisheries and Oceans, and the seaway and various ports and airports being transferred to local operating authorities. Transport Canada emerged from this process as a department focused on policy and regulation rather than transportation operations. In 2004, Transport Canada introduced non-passenger screening to enhance both airport and civil aviation security. Transport Canada is responsible for enforcing several Canadian legislation, including the Aeronautics Act, Transportation of Dangerous Goods Act, Motor Vehicle Safety Act, Canada Transportation Act, Railway Safety Act, Canada Shipping Act, 2001, Marine Transportation Security Act amongst others. Each inspector with delegated power from the Minister of Transport receives official credentials to exercise their power, as shown on the right. These inspectors are public officers identified within the Criminal Code of Canada. The Motor Vehicle Safety Act was established in 1971 in order to create safety standards for cars in Canada. The department also acts as the federal government's funding partner with provincial (and territorial) transport ministries on jointly-funded provincial transportation infrastructure projects for new highways. TC also manage a database of traffic collisions in Canada. Following allegations by shippers of service level deterioration, on April 7, 2008, the federal government of Canada launched a review of railway freight service within the country. Transport Canada, which is managing the review, plans to investigate the relationships between Canadian shippers and the rail industry, especially with regards to the two largest railroad companies in the country, Canadian Pacific Railway and Canadian National Railway. On June 26, 2013, the Fair Rail Freight Service Act became law which was a response to the Rail Freight Service Review’s Final Report. Transport Canada Marine Safety (TCMS) is another division under Transport Canada which maintains and enhances marine safety and work to protect life, health, property and the marine environment. This includes providing services that are mandated by acts and regulations such as certification for Canadian seafarers and related professionals. Transport Canada's role in aviation seems to be the most detailed. Until 1996, Transport Canada was responsible for both regulation of aviation and the operation of air traffic services, as well as the operation of most major airports. On November 1, 1996, these responsibilities were split: Transport Canada remains responsible for regulation (through the Canadian Aviation Regulations (CARs) and Standards), but a new regulated non-profit company, NAV CANADA, took over responsibility for all civilian air traffic services. This change was (and remains) controversial within the private aviation sector because NAV CANADA began charging for services that were previously funded through a specific tax on aviation gasoline. The specific tax remains but separate charges are levied by NAV CANADA. In 2005, the United States was discussing a similar delegation of the FAA's air traffic services to an "arm's-length" government corporation. During the 1990s, Transport Canada also began privatizing the operation of large airports, and divesting itself of small airports altogether (typically handing them over to municipalities). Following the 1994 National Airports Policy, Transport Canada retains ownership of most airports with 200,000 or more annual passenger movements, as well as the primary airports serving the federal, provincial, and territorial capitals, but leases most of these airports (which make up the National Airports System) to outside operators; currently, there are 26 airports in the system, of which 22 are operated by 21 Airport Authorities. In 2003, Transport Canada launched its Electronic Collection of Air Transportation Statistics program to collect passenger and cargo data in real-time from air carriers flying in Canada. ECATS will expand into the field of general aviation during 2008. Transport Canada also collects data on all accidents and incidents, no matter how minor, using the Civil Aviation Daily Occurrence Reporting System (CADORS). Transport Canada continues to be responsible for licensing pilots and other aviation specialists (such as dispatchers and mechanics) as well as registering and inspecting aircraft. It is also responsible for the safety certification and continuous safety oversight of most forms of commercial operations. These responsibilities are carried out by 6 regions, Atlantic, Quebec, Ontario, Prairie & Northern, Pacific and the sixth region based in Ottawa (National Capital Region) is responsible for air operators operating international flights and certain types of large aeroplanes. The Canadian Aviation Regulations (CARs) are also under Transport Canada control. The Canadian Air Transport Security Authority is a Crown corporation that reports to parliament through the Minister of Transport. It is responsible for the protection of specific elements of the air transportation system – from passenger and baggage screening to screening airport workers. Transport Canada's Civil Aviation (TCCA) Directorate is Canada's civil aviation authority. It has existed since 1936, when civil aviation was transferred from the Civil Aviation Branch of the Department of National Defence. After 1990, the role was transferred over to Transportation Safety Board of Canada. Transport Canada has been the centre of a number of controversies in recent years. In September 2009, the CBC's Fifth Estate produced a report "Riding on Risk", which detailed alleged mismanagement and cover-ups in Transport Canada. The story was sparked by a lost memory stick which was found by a journalism student. The memory stick contained many documents showing efforts by security inspectors to enforce aviation security regulations, and the perceived failure of management to do so. The CBC report also detailed the alleged reprisals — and fear of reprisals — against whistleblowers and other employees. Transport Canada's move to Safety Management Systems (SMS) in its regulation of civil aviation has been criticised. Whistleblower Hugh Danford, a former inspector at Transport Canada, went on record criticizing this approach, indicating that it would increase risk to the flying public. Critics have warned that introducing SMS to the aviation sector is "a recipe for disaster". However, the aviation accident rate in Canada declined over a number of years to 2008. The rail industry in Canada, which has had SMS since 2001 and is also regulated by Transport Canada, had shown a marked increase in accidents under this regulatory scheme to 2006. Several Transport Canada senior executives, including Assistant Deputy Minister, Safety and Security, Marc Grégoire, were sued in 2008 for reprisals against another whistleblower, Ian Bron. who reported that the Marine Security framework was riddled with gaps. On 23 December 2013, it was revealed that a Transport Canada inspector had been dismissed for falsifying departmental reports. The identity of the guilty party was not revealed, because of a concern for his or her privacy. The Canadian Association of Journalists nominated Transport Canada for its Secrecy Award for a second time in 2008, indicating that a bill to amend the Aeronautics Act will cause "a veil of secrecy [to] fall over all information reported by airlines about performance, safety violations, aviation safety problems and their resolution." In September 2009, Transport Canada was alleged to have fraudulently charged expenses to the non-existent Mackenzie Valley Pipeline project. This story came to light after repeated efforts by access to information expert Ken Rubin, and repeated denials by the department that the incriminating documents existed or that any impropriety had occurred. Transport Canada was criticized in 2008 for its refusal to approve electrical cars manufactured in Canada. As a result of the Ethiopian Airlines Flight 302 crash and the Lion Air Flight 610 crash, which occurred five months prior to the Ethiopian crash, most airlines and countries began grounding the Boeing 737 MAX 8 (and in many cases all MAX variants) due to safety concerns, but the Transport Canada declined to temporarily ground Boeing 737 Max 8 operating in Canada. However on 13 March, Transport Canada reversed the decision and grounded all 737 MAX 8 and MAX 9 aircraft. ecoAuto – Canadian government incentive program to purchase fuel-efficient vehicles. ^ "Contact Us". Retrieved 10 August 2015. ^ "Organizational Chart". Transport Canada. Retrieved 1 May 2016. ^ "Our Deputy Minister". Retrieved 1 May 2016. ^ "Organizational Chart". Retrieved 28 Nov 2017. ^ "Civil Aviation Directive (CAD) No. REG-009". Tc.gc.ca. 2010-06-28. Retrieved 2011-03-24. ^ a b "Statistiques sur les collisions de la route au Canada: 2016". www.tc.gc.ca. Transports Canada. 5 December 2017. ^ Dowd, Allan (2008-04-07). "Canada to review national railway freight service". Reuters. Retrieved 2008-04-29. ^ "Harper Government's new legislation in place to strengthen rail freight service". 2014-03-12. ^ "Transport Canada Seafarer Certifications - Canadian Merchant Navy". www.edumaritime.net. ^ "Canadian Aviation Regulations (SOR/96-433)". www.tc.gc.ca. Transport Canada. 11 July 2014. ^ "Electronic Collection of Air Transportation Statistics". Retrieved 10 August 2015. ^ "Civil Aviation Daily Occurrence Reporting System". Tc.gc.ca. ^ a b "CATSA About Us". catsa.gc.ca. ^ "Civil Aviation". www.tc.gc.ca. 22 June 2010. ^ "Aviation Photo Search". Airliners.net. ^ "Registration Details For CF-NAX (Nordair Ltd) L-188 Electra-C - PlaneLogger". www.planelogger.com. ^ "Riding on Risk". Cbc.ca. 2009-09-25. Retrieved 2011-03-24. ^ "Former aviation inspector: Transport Canada's "main concern was to get out of enforcement business"". Publicvalues.ca. Archived from the original on 2011-01-01. Retrieved 2011-03-24. ^ "Transportation Safety Board of Canada Aviation Statistics 2008". Tsb.gc.ca. 2009-03-02. Archived from the original on 2011-03-02. Retrieved 2011-03-24. ^ McGran, Kevin (2006-03-06). "Freight train accidents soar". Toronto: Thestar.com. Archived from the original on 2012-02-09. Retrieved 2011-03-24. ^ "No Content". Archived from the original on 1 August 2015. Retrieved 10 August 2015. ^ The Canadian Press (2008-01-23). "Marine security riddled with gaps: whistleblower". CBC.ca. Retrieved 2011-03-24. ^ "Transport Canada inspector faked safety reports". CTVNews. Retrieved 10 August 2015. ^ Canadian Association of Journalists. "Canadian Association of Journalists press release". Micro.newswire.ca. Archived from the original on 2016-01-09. Retrieved 2011-03-24. ^ Canada (2009-09-13). "Transport Canada 'fictitiously' expensing millions". Toronto: Theglobeandmail.com. Retrieved 2011-03-24. ^ "Getting at Ottawa's expenses in Transport Canada". Hilltimes.com. Archived from the original on 2011-06-11. Retrieved 2011-03-24. ^ Vancouver, The (2008-07-26). "Vancouver Sun: Transport Canada rules finish off electric car". Canada.com. Archived from the original on 2009-11-23. Retrieved 2011-03-24. ^ "Flying your drone safely and legally". tc.gc.ca. ^ "Canadian recreational drone users have basically been grounded". mobilesyrup.com. ^ "Canada not grounding Boeing 737 MAX planes despite EU airspace ban". Retrieved 2019-03-13. ^ "Canada grounds Boeing 737 Max 8 following fatal crash". CBC News. March 13, 2019. Retrieved March 6, 2019. ^ "Canada will ground the Boeing 737 MAX 8 after Ethiopian Airlines crash - National | Globalnews.ca". globalnews.ca. 2019-03-13. Retrieved 2019-03-16.